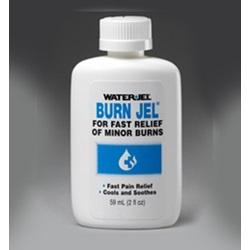 Water Jel Technologies - BURN JEL BOTTLE 2 OZ. BURN JEL BOTTLE 2 OZ. The same leading emergency treatment gel as Burn Jel Plus in a 2 ounce bottle. This thick gel cools and soothes minor burn injuries. Contains Tea Tree Oil and 2% lidocaine. The lidocaine relieves pain fast. No Vitamin E. Convenient squeeze bottle.